Reflection: Starbucks at the Met? Starbucks Is a Work of Art. What’s a Siren, and Why Is It on my Coffee Cup? 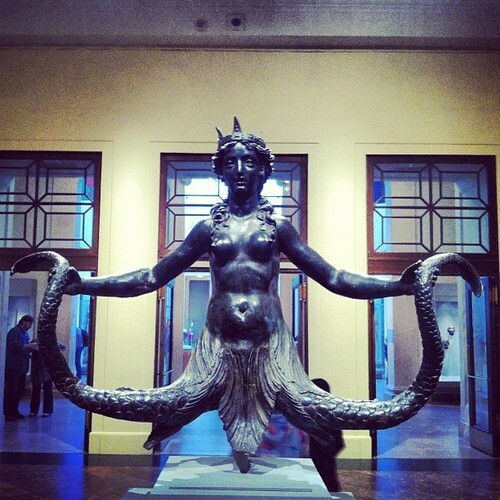 This particular statue, titled “Siren”, was made in the 16th century in Rome. While there a many statues depicting these creatures, this one appears to be the most similar to the original Starbucks Coffee logo, with twin tails and a hand holding each. Of course the logo has gone through several changes since its inception, but if you look up the original — or you’ve been drinking coffee long enough to remember — you’ll find the resemblance to be uncanny. Now why would Starbucks choose this hideously beautiful creature to be their mascot to the world? Well let’s think about this. A siren is a mythological creature that was said to entice sailors with a melodic song only to leave them ship wrecked on jagged rocks and thrust into the sea. How many of us hear the call of coffee in the morning? Despite the consequences of caffeine or the health risks of added sugars and the pastries that so often accompany it, we cannot seem to turn ourselves away. So here I am in New York City, walking to work — or wherever — when I happen to spot that oh’so familiar logo on the side of a building. Just like hearing the siren’s call, I cannot help but head that direction. And clearly, I’m seeing Starbucks wherever I go in this city. If you’d like more information on the relationship between Starbucks and the siren, you can check out this detailed video I found. It discusses the history of the logo and the mythology behind the siren.